If you have two different mods that have the same recipe using the same materials, then you got a conflict, and you would have no way to get access to all the items by the intended means. This mod allows multiple recipes sharing the same crafting layout to be crafted, the player being able to choose using either a cycle button, or a new key binding. How many recipes are conflicting is also displayed. See configuration file recipehandler.cfg for options. This mod makes the best efforts to support other crafting tables, using an automated detection system, but no guarantee can be made that behavior will match desired outcome. The point of having a switch is for people to choose what they want. Forcing a sorting style may not be to everyone's taste. Is there any way this can be fixed on your end? Feature request: Can we have a config option to make the button hidden if there are no conflicts? Both Refined Storage crafter and Actually Additions "Craft table on a stick" work fine with the mod. Did you even check before asking for compatibility ? Forestry and AE2 are not ready for 1.11 yet. I already spent multiple hours trying to find a bug that didn't exist because you couldn't spend one second downloading the mod. Please get out of my face and never come back. Will you be adding compatability with Applied Energistics 2? Do I need to add this server side? or just client side? Both. Server and client handle recipes. People don't assign random recipes - they're logical combinations of shapes and materials. That really *really* reduces your space. I get a crash in the crafting GUI with vanilla and modded crafting benches whenever I try to craft. It only happens if the arrow button is enabled in the config. I am using forge 2215. It looks like Cyclic mod workbench doesn't work with a shaped recipe. That is all i can find about your issue. Ditto that and I'll take a 1.11.2 version too! put up a donate link and I'll send you 5 bucks! This is a great mod you need to get you a hamburger, fries and drink for all of your effort! Just tested your 1.11 version on 1.11.2 and it works, you can save yourself the hassle and just add the 1.11.2 tag to what you've released. There is a recipe conflict between Dungeon Tactics Diamond Sword and Minecraft's own diamond sword since they both use the same recipe. Is there a way to fix this conflict on your side? Well with a vanilla recipe, it should be the mod responsibility to avoid the conflict. But i see no reason why my mod wouldn't be able to handle that like anything else. Yeah it is strange why your mod doesn't handle the conflict. 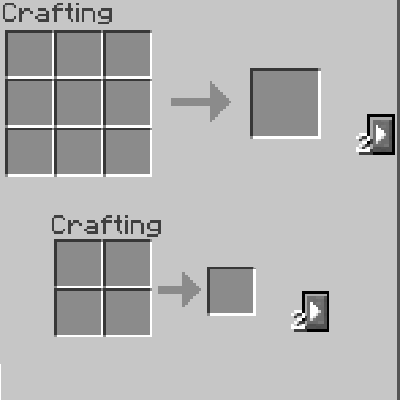 I was going to use something like CraftTweaker, but I'd rather use something easier such as a GUI ingame to make recipes. Thanks for the feedback though I appreciate it. In other words the modder responsible for Dungeon Tactics doesn't wish to resolve the conflict.